Background:This is another gift from my friend Gene. This will be my first time having this beer. I’m very intrigued by the label and swing top, can’t wait to get started. This will also be a good start to the upcoming great beer seasons of Fall and Winter brews. 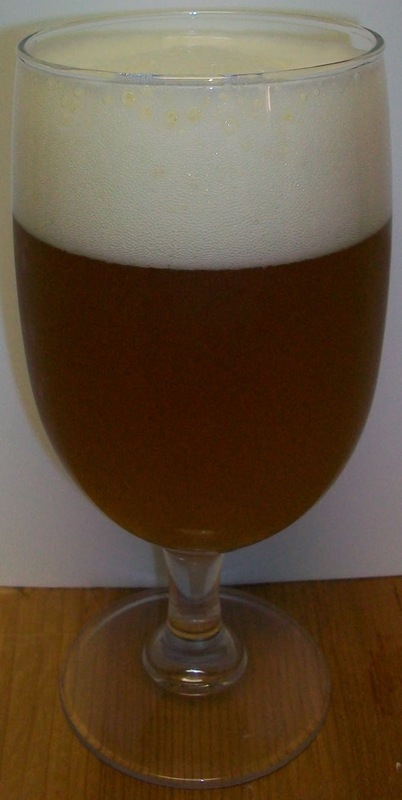 Review:The beer pours a hazy pale copper with a very rich bright white head. The head has a very unique look to it with combination of creamy and soapy bubbles. The nose is very interesting. At first you think typical German lager malt and hop aromas. Then you start to pick up more interesting aspects of richer malts almost like a Swartz bier (dark lager). There is also in earthy almost mineral water aromas on the nose of this beer. The nose is so interesting I can’t wait to dive in and see what this taste like. Wow, this is really nice, different but also very good. There is a very unique taste to this beer, it’s a hard to put my finger on it. It’s mineral, like hard water, similar to some English ales with that unique mineral water taste. Let me try a play by play. The experience starts out with light sweet malts up front on the tip of the tongue. Then there is a very nice almost creamy mouthfeel during the middle of the sip. Also in mid-sip there is a building malt harshness. Well, I’m not sure harshness is correct it’s a building intensity of that mineral flavor. This building flavor carries through to the back-end. There is a lot of flavor on the back-end throughout the swallow. The finish if fairly dry with this unique malt flavor and some light hops just enough to dry but not enough to bitter the beer. The lingering aftertaste is that of this unique malt flavor. I’m sorry but I’m having a hard time describing this malt flavor. It has qualities of caramel malt but without the sweetness. It has an almost chalky quality like a wheat beer but again without the sweetness also. And it sometimes reminds me of a Schwarzbier. 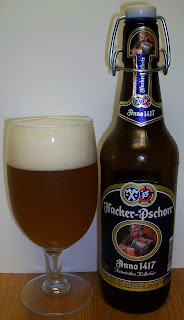 I have had a few other German beers like Kulmbacher EKU Pils with this same quality but I have not reviewed them. Also this flavor is very close to that mineral water flavor in some English Ales like Newcastle Brown. All and all I really do like this beer. The unique malt flavor may take a little to get use to but once accustomed to it this is really a pretty good beer. There is a nice, almost creaminess to this beer. I’m not sure if I’m just getting more use to these flavors or weather the beer is getting smoother as it warms but I am enjoying this more now as it warms and opens up a little. We are now at 67 degrees. Although I did not take a starting temperature it must have been between 40 – 45 degrees since the beer fridge is at 40 degrees. There is also a nice yeastiness to this beer. That may also be part of this unique flavor. I’m giving this beer a B. I usually don’t rate beers on the first review of that style but I’m making an exception in this case. This rating may go up or down as I have more of this Keller Bier / Zwickel Bier style but for now I’m sticking to a B. Even for a good overall rating. I do recommend this beer. It’s earthy malt flavors and heartiness will be widely appealing to a great many beer drinkers. Thanks Gene for another good beer.